Senator Bernie Sanders wants to dramatically increase the burden of government and he claims that his policies won’t lead to economic misery because nations such as Sweden show that you can be a prosperous country with a big welfare state. Perhaps, but there are degrees of prosperity. And a large public sector imposes a non-trivial burden on Nordic nations, resulting in living standards that lag U.S. levels according to OECD data. 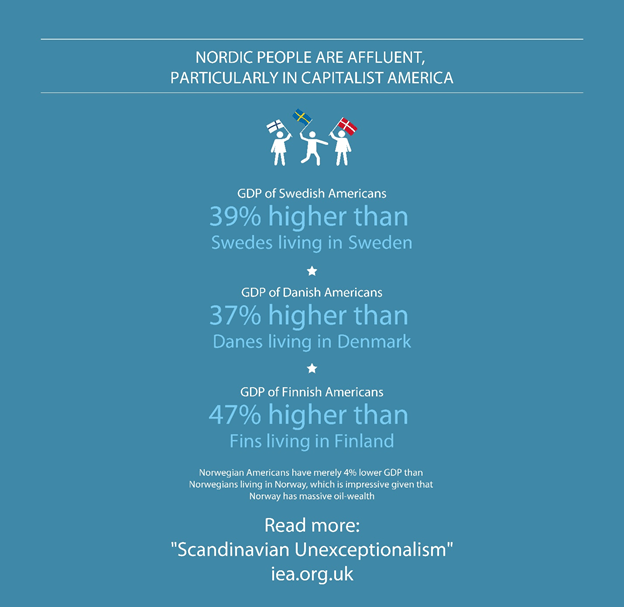 Moreover, according to research by a Swedish economist, people of Scandinavian descent in America produce and earn much more than their counterparts at home. That’s not exactly a ringing endorsement of the Nordic Model. But there actually are some things we can learn from places such as Sweden. And not just things to avoid. As Johan Norberg explains in this short video (you may have to double-click and watch it on the YouTube site), there are some very good policies in his home country. Indeed, in some ways, his nation is more free market than America. I especially like Johan’s explanation about how Sweden became a rich country before the welfare state was adopted. And he’s right that Sweden had a smaller government and a lower tax burden than the United States for a long period. Indeed, there was very little income redistribution until the 1960s. But once the welfare state was adopted, the Swedes went crazy and dramatically increased tax rates and the burden of government spending. And, as Johan explained, that’s when Sweden’s relative prosperity began to drop. And big government eventually led to an economic crisis in the early 1990s, which has sobered up Swedish officials and policy in recent decades has been moving in the right direction. Including significant reductions in the budget and lower tax rates (though the fiscal burden is still far too high). I particularly like Johan’s advice to copy what works. We should partially privatize our Social Security system (actually, we should be like Australia and have full privatization, but we should at least get the ball rolling). And we should have extensive school choice like Sweden. Moreover, let’s copy the Swedes and get rid of the death tax. Sweden is actually a very pro-market country, albeit one that is weighed down by a large welfare state and excessive taxation. Interestingly, if you look at the non-fiscal policy variables from Economic Freedom of the World, Sweden actually ranks much higher than the United States (along with many other Nordic nations). The bottom line is that Sweden actually is somewhat like the United States. There are some very bad policies and some fairly decent policies. 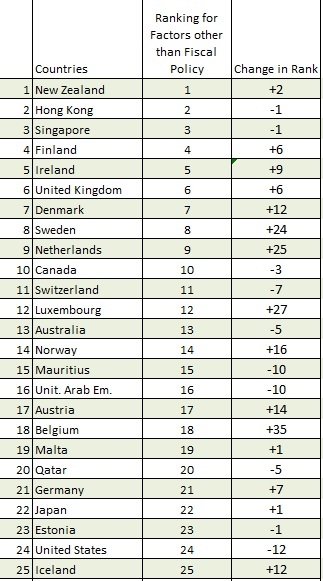 America ranks above Sweden in a couple of areas, but lags in other areas. The net result is that we’re both more market-oriented than the average western nation (compare Sweden and Greece, for instance), but both well behind the pace setters for economic liberty, Hong Kong and Singapore. For more information on this topic, here’s a video from the Center for Freedom and Prosperity that features another Swede explaining what works and doesn’t work in her country. P.S. Denmark is a lot like Sweden. A crushing tax burden and extravagant welfare state, but also hyper-free market policies in other areas (and maybe some fiscal progress if Denmark continues to follow the Golden Rule). One should take mr norbergs opinions with some skepsis. The man is a multiculturalist who argues that if we abolish borders, checks and controls of who goes where, all will be well. In sweden only the most vulgar and delusional liberals (classical definition, not current day american) and libertarians given any thought. I would recommend Tino and Nima Sanandaji, a pair of swedish economists of kurdish heritage, and Joakim Ruist. These three lack the overt political agenda of Norberg. Instead they apply a scientific approach rather than Norberg’s naïve utopian and culturally ignorant demagogouery.